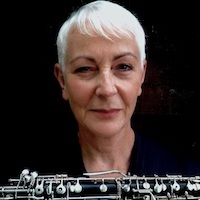 Oboist Jane Marshall studied at the Guildhall School of Music and Drama, where she was awarded the Worshipful Company of Musicians’ medal for most outstanding music student of her year. She won the London area final of the first LSO/Shell Scholarship and as a result, broadcast the Mozart Oboe Quartet with the Coull Quartet on Capital Radio. The following year she made her South Bank debut in the Purcell Room as a winner of the Masie Lewis Young Artists Fund. Abroad, Jane has performed the Strauss Oboe Concerto in Paris, the Mozart Oboe Concerto on Dutch (AVRO) Television and the Vaughan-Williams in Rome and Ravenna. Jane was offered a scholarship to continue her studies with Maurice Bourgue in Paris, but instead decided to take up the position of Principal Cor Anglais with the BBC Symphony Orchestra. During her time there she performed in many televised and broadcast Proms. She left to take up the same position with The Philharmonia Orchestra and spent over 16 years travelling extensively and performing with some of the worlds finest conductors both in concert halls around the globe and on the Philharmonia's many recordings. As soloist, she performed with them at Buckingham Palace in the presence of HRH Prince Charles and the late Princess of Wales and also with John Wallace and the Nash Ensemble at the Q.E.H. Jane now enjoys freelancing with all the London Orchestras and spends much of her time at Abbey Road and Air studios playing on the soundtrack of many well known films. She is also Professor of Cor Anglais at both the Royal College of Music and the Guildhall School of Music and Drama.